Truth and Light: Doctrine and Covenants Lesson 38 "In Mine Own Way"
Doctrine and Covenants Lesson 38 "In Mine Own Way"
"So there's this huge flood one day, and an entire town looks like it's going to be swallowed. One man is sitting on the roof with the water lapping around his ankles when the emergency services come along in a boat and tell him to jump on board. So about an hour later they're zooming past in the boat again and they notice the man's still there, only the water's up to his waist, almost at the top of the roof.. "Quick" they say, get in the boat, it's going to get worst before it gets better. An hour after that a rescue helicopter flies over the area and notices the man, who must be standing on the peak of the roof now, with only his head and shoulders out of the water. "GRAB THE ROPE!" they cry "IT'S YOUR ONLY HOPE!" So he gets drowned of course. And he goes to heaven, and is a little ticked off with Heavenly Father for drowning him like that, and expresses his concern saying "I had FAITH, I BELIEVED in you - and still you didn't help me"
While this is an amusing story it speaks to the theme of the lesson today. Christians are often at loggerheads on the topics of faith and works. Some even see the two principles as a dichotomy. As Latter-Day Saints we believe that they should and do co-exist but getting the right balance is really a key to surviving the floods of life that we face. Noah was saved because he understood and followed the Lord's way. 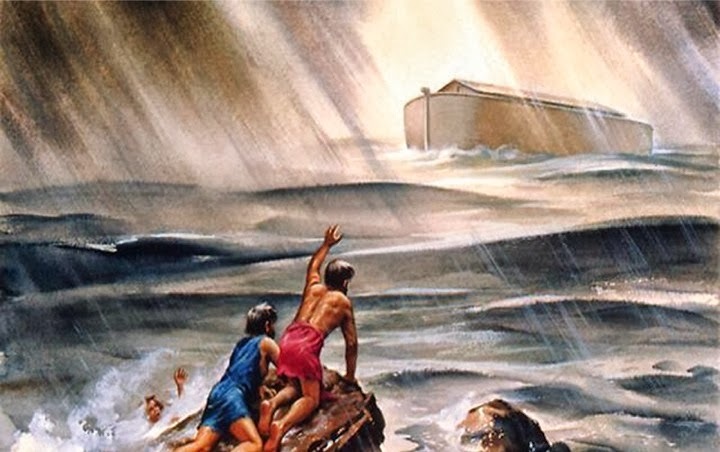 Another man who faced a pretty severe flood and called on God and had a boat as a means of escape was Noah. As I prepared this lesson my mind has been drawn to his story a lot. And his life gives us a much better example than the man in our first story, of how to couple faith with works. As we go through this lesson and you consider all the obstacles you encounter in fulfilling the Lord's way ponder on Noah: "a just man and perfect in his generations" he nevertheless reached a point where he and his family were the only righteous people on the earth. Talk about facing constant temptation alone.! That requires immense personal spiritual strength. How easy would it be to give in to the neighbours mocking and taunting your weird habits and lifestyle and the world condemning your "out-of-touch-with-modern-times" morality! Anyone complaining about living a little too far from their chapel or their temple? Then add on top of that a failed mission - not one convert in 120 years! Any missionaries struggling out there today? Wow! This man's testimony must have been incredible. So keep Noah in mind as we go through the lesson today. The Saints are pretty nervous and maybe scared and are asking the Lord why they have to leave their homes and farms and crops in New York and travel 300 miles to Ohio (wait till they see the rest of the travel itinerary!) and in reply the Lord gives them this wonderful sermon, essentially saying it might not make sense to you but trust me - it's for your good. What elements of faith and works (trusting in the Lord's way and self-reliance) do we see in these verses? Notice the Lord heard their prayers. Not prayer but plural...prayerS. As Oliver Cowdery declared in the footnotes of Joseph Smith History, "the Lord...is ever willing to answer the consistent prayer of the humble". And as Nephi asked his brothers "Have ye inquired of the Lord? "(1 Nephi 15:7-8). Consider also these questions: what does it mean to "treasure up wisdom"? Whose is the voice that "shakes the earth" and whose voice is louder? It reminds me of a loving Father who does not want to shout at His children. Instead he whispers and shakes the earth around us to get our attention without actually harming us. But if we do not listen to those quiet feelings and promptings and changes around us then the loud wickedness of men will scream in our lives and could well do harm. Which voice do you prefer to live with? Did you see the formula the Lord gave them in these verses for be prepared for life's floods? Look again! "And if ye are prepared - ye shall not fear!" 3 years on from the first scripture we read and the Saints are surviving in different ways. Some are richer, some are poorer. It must have been an exciting and a tough time or as Charles Dickens may have put it,"it was the best of times and it was the worst of times". What did the Lord teach us here? Who is the Lord going to make accountable for and a steward over earthly blessings? EVERYONE. Even the poorest of the poor has been given certain earthly blessings that they are a steward over and will be accountable for. Why do we need to be accountable for our blessings? At Christmas, could you imagine if people came back and asked what you did with the presents they gave you. Have you used them? Do you still have them? How often do you use it? I imagine for some of us it could be an awkward conversation. So, why does the Lord want to have this conversation with us? v.16 "BUT it must needs be done in MINE OWN WAY"
What does that mean – poor shall be exalted, in that the rich are made low? Seems nice for the poor but odd and unfair for the rich – what is the Lord teaching us here? Why does he do it this way? To accommodate our agency and to teach us to love with the pure love of Christ. That really is the crux of it all. v.17 Earth is full and there is enough to spare. “The United Nations says there are more than 900 million hungry people in the world, and yet a new report from the U.N.’s Food and Agricultural Organization (FAO) finds nearly a third of the world's food supply—over 1.3 billion tons—goes to waste each year. And what does the Lord say about this to those that have an abundance or are rich? Doctrine and Covenants 56:16 Powerful! Do you want to be left saying "the harvest is over, the summer is ended and my soul is not saved!" And what does the Lord say to the poor? Doctrine and Covenants 56:17-18 Do you want to be considered as one of those that "will not labour with your own hands". These are principles you want to learn and then teach your children. “Our primary purpose was to set up, in so far as it might be possible, a system under which the curse of idleness would be done away with, the evils of a dole abolished, and independence, industry, thrift and self respect be once more established amongst our people. The aim of the Church is to help the people to help themselves. Work is to be re-enthroned as the ruling principle of the lives of our Church membership” (in Conference Report, Oct. 1936, 3). So how can we apply this to our temporal and spiritual lives? It seems a pretty clear instruction on how to stay temporally self-reliant. I would consider this the "treasure up wisdom" part of the formula. If you add prayer and listening to and following the Lord's voice then you should be prepared for any financial problems and avoid a lot of the fear and stress others who do not follow these instructions encounter. How about spiritually? Well just look at the same instructions but with a spiritual eye. Do you see it? Debt being sin, saving becomes building testimony, paying tithing is saying your prayers, reading your scriptures, promised obligations are fulfilling our priesthood and church membership responsibilities. Let's conclude by going back to Noah. He cried repentance for 120 years to his people and yet they did not heed the warnings or prepare. In life, we may all face smaller floods such as a real basement flood (as some of our neighbours did a year ago) or a metaphorical basement flood as my family did this summer when I lost my job. The question is will you be prepared or will you sit on your rooftop waiting for the Lord to bale you out. I wasn’t prepared financially but luckily I was prepared a little better spiritually. I and many others prayed, I looked for jobs and submitted resumes every day, I worked hard previously at a good education, I followed the prompting to apply for a position and an industry I had never worked in before. The Lord in his loving way provided a way for us this time, because I didn't just sit around waiting...but financially it was tough because we were not prepared. At some point we must become self-reliant, prepared and faithful like Noah– whether rich or poor, spiritually or temporally – will your soul be saved because you trusted and followed in God’s way or will you find that eventually the harvest is past, the summer is ended and your soul is not saved? *If you want to study deeper into Noah's back story and why the Lord allows man his agency and in so doing creates such a disparity between rich and poor and good and wicked on earth then study the book of Moses 7:19-52. It is a wonderful discourse on how much the Lord loves us but due to our agency requires us to love (v33 is key love one another). Thanks, I have learned a lot from this class. Me too Elizabeth! It's always nice to hear that from others. Thank you.